Need new apps for your favorite device? Here are 101 iPhone, iPad and iPod touch apps that just hit the App Store. 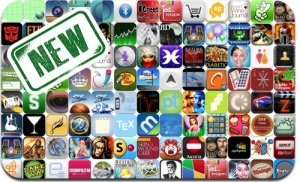 This new apps alert includes Blood & Glory: Legend, Puzzle Shot, Bastion, Blood Brothers, Spellet, ▻Sudoku, Crazy Tribes, Family Vacation: California, Carnival Balloons & Lights, AnyShape, Moshpic, and many others.